Sydney Swans 2005 premiership player Tadhg Kennelly says the development of the Gold Coast Suns and Greater Western Sydney Giants has made the AFL more competitive. 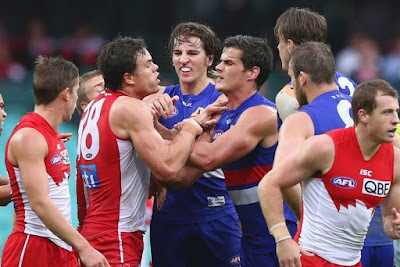 The Bulldogs, Swans, Suns and Kangaroos are the only undefeated teams, while just the Blues, Lions, Dockers and Saints remain winless, with all other teams having a win and a loss from the first two rounds. The unpredictability is a welcomed change for the AFL, according to Kennelly. "That's great for the competition," Kennelly told SportsFan. "It's very difficult for us tipping, but that's what you want. "It's hard to predict who's going to win and what's going to happen. "With the Giants and Suns now five and six years in the competition... They've got strong lists. "In the competition as a whole, you've got really 13 teams that are trying to get into the eight, and that's great and healthy for the competition. "You've probably got another five that look like they won't make the eight." Kennelly says even Carlton, who suffered a 60-point loss to the Swans, have showed some signs of promise. "You saw Carlton with a 10-goal loss, it was a bit of a blow but that's not too bad," he said. "They'd be happy with that, you'd like to keep it under 10 goals if you were Carlton."